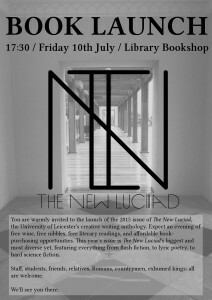 You are all warmly invited to the launch of the 2015 edition of The New Luciad, the University of Leicester’s Creative Writing magazine. The event will take place in the Library Bookshop at 5.30pm on Friday the 10th of July. We will be providing wine, juice, and snacks, and asking some of our successful contributors to read from their work. Copies of The New Luciad will then go on sale. This year’s edition features some wonderful content ranging from flash poeYou are all warmly invited to the launch of the 2015 edition of The New Luciad, the University of Leicester’s Creative Writing magazine.try to sci-fi, and provides an excellent overview of creative talent from all levels of the University. Originally entitled Luciad, the creative writing magazine has been in existence since the University’s inception, and has been contributed to by such figures as C. P. Snow and Malcolm Bradbury. It was revived in 2013 by Rob Ward thanks to the University’s Centre for New Writing, and has been running annually since then. We hope to see you there. Friends and relatives are also welcome to join us.